This Quest offers a backpack adventure on the Vermont Long Trail in the U.S. Play in the Wild! Animators will offer practices in Being Nonviolence through Yoga, Mindfulness Practices, Meditation, Nonviolent Communication, Storytelling, Vision Quest, Swimming, Tracking the Inner and Outer Wild, Cooking, and lots more! Animators on team will include (but not limited to) Catherine Cadden, Jesse Wiens, and Chris Wilden. Our base camp will be in the beautiful forest of Wild! Heart Farm & Refuge. There, we will prepare for our time on the Long Trail, physically, emotionally, intellectually, and spiritually. We will use this time to dive deeply into our practices of Nonviolence to understand our inner world as well as build our community to discover what it means to live in Culture of Empathy. After we come off the Long Trail, we will return to Wild! Heart Farm & Refuge to integrate our experiences and prepare ourselves for the return home. We will take this time to create art and journal to take reminders home of the life we want to live. We will travel together by car from base camp to The Long Trail, the oldest long-distance hiking trail in the United States. We will take the skills we learned in our time at Wild! 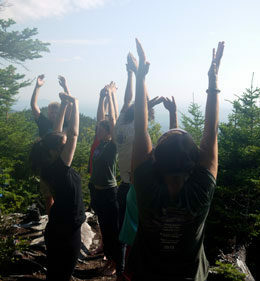 Heart Farm & Refuge and hone them on trail in the wilderness of the Green Mountains. We will take our time and traverse as much terrain as our group decides. Along the way, we’ll engage Trail Magic and our Quest community to broaden and deepen our journey. Hours from this Quest can be applied to certiﬁcation with the Center for Nonviolent Communication and may apply towards course study in certain schools or CEUs. We will create a rotation of leadership and support to provide meals for the whole group. We will provide organic lacto-ovo vegetarian meals. In the tradition of Play in the Wild!, these will be gourmet, unique, delicious ﬂavors from around the world especially suited for the trail. Participants traveling by Air, plan to fly into Montreal, Quebec, Canada or Burlington, Vermont, USA no later than 3pm on July 31st and depart no earlier than 3pm on August 14th. We will provide airport pick-up and drop-off only on these days. Participants traveling direct to Wild! Heart Farm & Refuge. Plan to arrive between 1pm and 5pm on July 31st and be picked up between 10am and 2pm on August 14th. 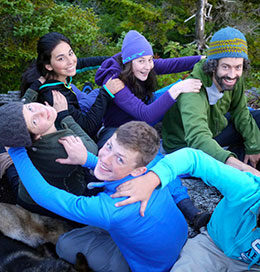 $1869USD Tuition – This contribution covers costs of insurance, materials, all food, first aid supplies, art materials, forest use fees, transportation and equipment rentals for the Quest, donation to facility use, sustainability for Play in the Wild! and the Animators leading the training, and miscellaneous surprises for the students. Click on the Sign Up Here! button at the bottom of this page to fill out an online Application and submit your $55 application fee. After we receive your Application and application fee, we will schedule an interview with you by phone or Zoom to see if this program is a fit for your needs and to assess medical or behavioral histories that could pose a threat to your safety or the safety of others. If there is mutual agreement in the interview that the program is a fit, then we will send you a Registration Packet. Fill out the Registration Packet and return it to Play in the Wild! along with your full $1869 Tuition (unless an alternative financial arrangement has been made during your interview).